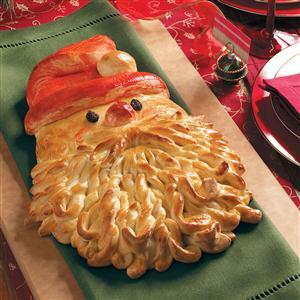 Make your own tasty Santa Bread with this great recipe! People are often a little nervous about making their own bread, but with this easily followed recipe, there is no need to worry. What could be more Christmassy than a loaf of Santa himself! Heat the milk, water and butter in a small saucepan until they reach around 50&deg;C. (Tip: If you do not have a thermometer, you can use boiling water and add this to cold milk). Briefly mix the dry ingredients in the bowl, then add the heated liquid mixture. Then beat until moistened. Beat in the eggs until the mixture is smooth, then add and stir in remaining flour gradually until the mixture forms a stiff dough. Flour a surface and then tip the dough onto it. Knead the dough until it has a smooth and elastic consistency - this should take around 7 minutes. Place the kneaded dough into a greased bowl - turning once so that the entire surface is greased. Cover with a damp tea-towel or cling-flim and leave to rise in a warm place. The dough should double in size in about 1 hour. Knock the dough back - hitting the air out of it and then turn onto a lightly floured surface. Split into 2 portions, one slightly larger than the other. Preheat oven to 180&deg;C.
Shape the larger portion into a triangle with rounded corners - this will form Santa's head and hat. Divide the smaller portion in half. One half will form Santa's beard - shape and flatten. Then, using a pizza cutter or scissors, cut into strips up from the point of the beard up to about an inch away from the top. These can be twisted and curled to give a more beard-like appearance. Use the remaining dough to form the moustache, nose, hat pom-pom and brim. Roll a thin strip for the hat brim and position under hat. Fold the top tip of the hat over and add another ball of dough for the pom-pom. With the final dough, shape both a nose and moustache. For the mustache shape and flatten, and cut ends into small strips with scissors. Place on Santa and then place the nose above. Cut 2 slits for eyes and put raisins into the slits. Beat the 2 eggs yolks in separate bowls. To one add red food colouring and brush over hat, nose and cheeks. Brush the plain yolk over the remainder of the dough. Cover loosely with aluminium foil and bake for 15 minutes. Uncover the dough, and bake for another 10 minutes or until golden brown.